According to Patrick Grossi, Preservation Alliance for Greater Philadelphia’s Director of Advocacy, anybody can nominate a building. 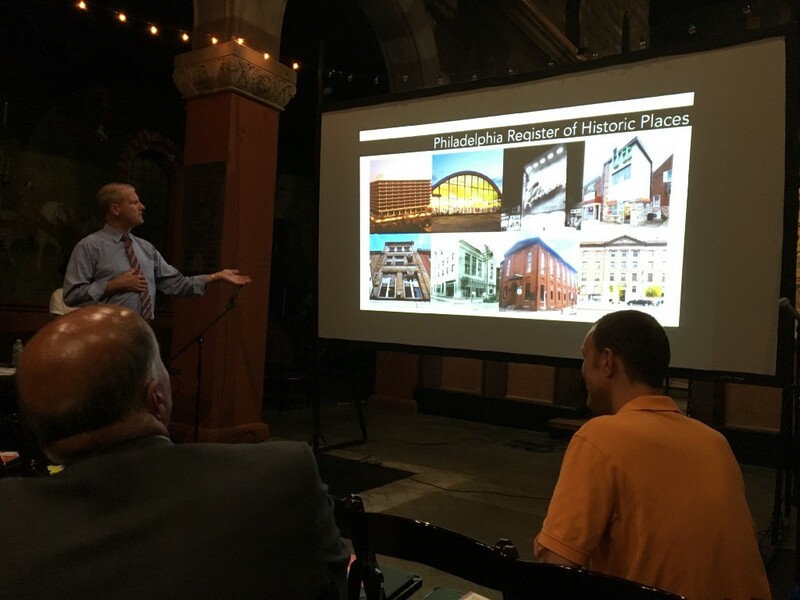 Preservation Alliance for Greater Philadelphia’s Executive Director Paul Steinke was on hand at last week’s meeting. Members from the Preservation Alliance for Greater Philadelphia took to the Bella Vista Neighbors Association meeting Wednesday night to discuss the process for nominating and designating buildings (or structures, sites and objects) to Philadelphia’s register of historic designations. The Preservation Alliance regularly nominates buildings for consideration by the Historical Commission. According to Patrick Grossi, the preservation alliance’s director of advocacy, anybody can nominate a building. Of all the criteria, numbers 6, 7 and 8 are among the most uncommonly cited. According to Caroline Slama, Preservation Alliance for Greater Philadelphia’s associate director of preservation services, the architectural integrity of the building is not necessarily a requirement to become designated. Some buildings have gone through many architectural changes over the years, but as long as there’s a considerable amount of historic significance to the building, they can still be good candidates for historic designation. Once an application is submitted for nomination, it goes through three levels of review, Grossi said. First, the PHC staff goes through the paperwork to make sure everything is “complete and correct,” Grossi said. If everything checks out, the nomination then goes to a historical commission subcommittee, which is comprised of scholars, architectural historians. “They’ll review it and make recommendation whether it should be designated or not,” Grossi said. If they recommend in favor of its designation, the nomination then goes to the full commission, which makes the final decision. If a property is designated, the PHC has jurisdiction over any potential new construction, such as additions or alterations and especially demolition, Grossi said. Alternatively, the building could be deemed “imminently dangerous” either by a private structural engineer or with cooperation from L and I, which could also lead to demolition. According to Grossi, major changes, alterations, maintenance, or repairs to a historically designated building that require a building permit from L and I would get flagged and sent to the PHC to go through the permit process. For more information about the PHC, visit phila.gov/historical. A previous version of this article conflated the Philadelphia Historical Commission and the Preservation Alliance for Greater Philadelphia. The issue has been corrected.